I have spring fever and I’m procrastinating working on my books today- plus I’ve still got some “Spring Forward” lag. I’ve actually heard a rumor that Missouri is considering doing away with the observance of daylight savings time. I wondered why exactly did we begin observing DST? So, I did some reading. Turns out, I couldn’t find an absolutely definitive answer, but many references cited World War I and II. In order to reduce the use of fuel used for artificial lighting, people began turning the clocks back in fall. I read that half of Indiana observes DST and half the state doesn’t. Yeesh, how annoying would that be if you lived on the dividing line? 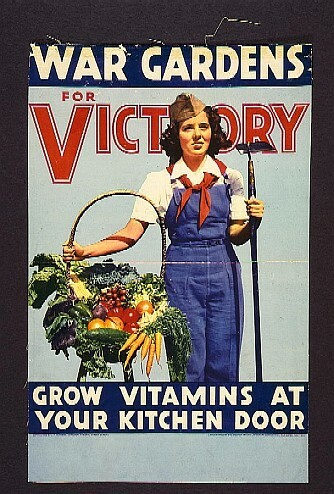 What interested me amidst the DST debate was the mention of Victory Gardens. Apparently, in World War II, citizens were encouraged to grow vegetable, fruit and herb gardens to reduce pressure on the public food supply. People dug up their yards and even spaces in public parks to contribute to the production of food in the US, United Kingdom and Canada. Victory gardens could be found in backyards, on rooftops in the cities; many vacant lots were borrowed to use as cornfields. Lawn areas in Hyde Park, London; around Riverside in New York City and Golden Gate in San Francisco were all plowed and planted to publicize the victory garden movement. During World War II, many farmers were drafted into the military and especially in Europe; farms were destroyed as the war moved through those areas. 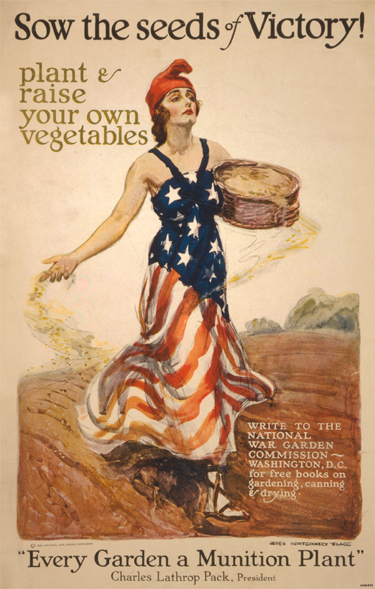 In 1917, the U.S. formed the National War Garden Commission overseeing the Victory Gardens campaign. Over five million gardens were planted, producing more than $1.2 billion in homegrown food by the end of the war. 20 million Americans tended Victory Gardens; they accounted for almost half the produce being consumed in the U.S. during World War II. Even Eleanor Roosevelt participated in the effort, planting a Victory Garden on the White House grounds. 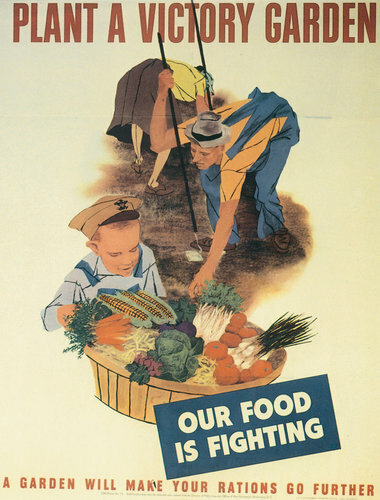 Posters and public service booklets proclaimed “Our food is fighting!” All that produce helped lower the price of vegetables needed by the U.S. War Department; the money saved could be spent in other areas of the military. One of the reasons for implementing daylight savings time was supposedly to aid in the tending of the Victory Gardens. With many of the men at war and women stepping in to temporarily fill jobs left behind, many women were at work during daylight hours. Extending the amount of evening daylight available, gave them an extra hour after work to tend their gardens. There are a few examples of Victory Gardens left in in the United States; Fenway Victory Gardens in Boston, Massachusetts (now mostly planted with flowers) and Dowling Community Garden in Minneapolis (Still veggies!) have remained active since WWII. In recent years, the idea of the Victory Garden has resurfaced somewhat; a few have been replanted in public spaces, a websites and blogs such as http://www.modernvictorygarden.com/ promote their own Victory Gardens and encourage others to join in planting their own. In March of 2009, a garden was again planted on the White House Lawn, the first since Eleanor Roosevelt’s, to raise healthy food awareness. Many health conscious families are starting gardens for the first time, in an attempt to cut back on the hormones, pesticides and chemicals present in processed and even fresh commercial fruits and vegetables. Categories: Gardening | Tags: create your own victory garden, current victory garden, daylight savings and victory gardens, daylight savings time, edible garden, growing produce for war effort, history of victory gardens, patriotic victory garden, plant victory garden, planting victory gardens, private victory garden, public food supply, public victory garden, reasons for daylgiht savings time, victory garden, Victory garden daylight savings, victory garden movement, victory garden parks, Victory garden public, victory garden united states, victory garden war commission, victory garden WWI, victory garden WWII, victory gardens, victory gardens produce WWII | Permalink.